What are the possible consequences? We all remember HAL 9000 from the cult film “2001: A Space Odyssey”, shown at the time as a perfect example of a future artificial intelligence, but also ready to destroy human life in order to achieve a given objective, without much empathy. That is why it is important to talk about digital empathy. How do you define digital empathy? In the digitalization era, digital empathy means dedicating ourselves to understanding human feelings and needs in order to satisfy them by applying advanced technologies. The term “digital empathy” sounds somewhat counterintuitive, probably because we don’t expect the advanced technologies to bring, every time, a deeper understanding of human needs. After all, we have so far taught robots how to think and learn by themselves, but not how to feel. sentiment analysis which involves processing large data quantities; however, it is applied neuroscience that leads directly to the center of decision-making – the human brain. How can organizations use applied neuroscience in digitalization? In the past decade or so, technological advancements in applied neuroscience allowed us to track changes in the clients’ emotional states in real time. Why is that important? It is a biological fact that our every-day decisions are sub conscientiously influenced by our emotions. With the electroencephalogram (EEG), the eye-tracking smart glasses, the face and voice recognition software, and various biometric methods, we are able to penetrate deeper into the human brain and understand such emotions. Thus we improve the ability of organizations to adjust to users by understanding them better, thus showing their “emotional intelligence.” Some of the leading experts in field of applied neuroscience, such as dr Nikolaos Dimitrijadis of the University of Sheffield, predict that, in order to remain competitive, future organizations will have to become “emotionally intelligent”. What do you see as a solution? The organizations capable of empathizing with their clients have incomparably better chance of reducing the number of negative, and increasing the number of positive user experiences, thus achieving a sense of connection with their clients, which in turn contributes to heightening the clients’ emotional engagement. A Gallup research shows that emotionally engaged clients bring in 37% more income to the banks in which they have an account, than those who are actively unengaged. The emotionally engaged clients are three times more likely to repeat a purchase and to recommend it to others, 44% less likely to look for competing offers, and 33% less likely to be price-sensitive. The clients of tomorrow will be even more sophisticated and informed, and will have greater expectations in terms of having their needs accommodated through personal user experience. This is precisely why, in the future, we will need not only more intelligent businesses, but also emotionally more intelligent businesses. We have experienced first 16 years of the 21st century by now. Eventually, the pace of radical innovations has accelerated again and we see the society transforming. The way we interact with each other, the way how we consume services and our expectations have shifted towards immediate fulfilment, instant gratification. It all began with the internet which at first had a form of a bulletin services accessed through a text console interface by scientists and computer geeks. Then, we have gone through the phase of internet browsers on PCs while we have witnessed first steps in e-commerce and emerging online banking. We are now in the third major evolution stage as we consume information services on our smartphones mainly through a number of single purpose apps which are pushing the built-in browser in your smartphone into oblivion. It seems that there is another trend emerging in the "smartphone stage" which may become bigger than smartphones themselves. The trend is a fundamental shift from a user interface built around shape and form of the device e.g. a PC web browser built to be handled by keyboard and mouse to a human centred interface e.g. interacting with fingers, gestures, voice, or perhaps in the future with thoughts (biofeedback). But why we would need apps for human centred interactions with technology? Apps will transform into services that will work silently in the background while we will communicate with artificially intelligent beings whose ancestors, well alive today, are called digital assistants, chatbots, Siri, Alexa or Cortana. They live on a cloud platform and manifest themselves when we push the button on our iPhones, when we address them in our living room, or most commonly when we are typing or talking to our favourite messaging app. The messaging apps seem to become the bridge between today and tomorrow. They are the most frequently used apps today. Their increasing usefulness is the number one cause for the mass extinction of the single purpose apps. There are becoming platforms themselves enveloping services which in the past we needed to download, launch, and register within a separate app. For illustration, the most popular Chinese messaging app WeChat apart from communicating with friends incorporates food delivery, ordering a taxi, arranging a date, disseminating news, sending a payment, asking for a credit, and more to come. All these useful services are accessed by typing or dictating text to your chat buddy who is in ever increasing number of cases an intelligent robot rather than human. There is another reason for the emergence of robots and conversational services. The advent of massive computational complexes and ultra-fast processing routines allow storing gazillion times more on the web, as well as capture near infinite new trove of data. Originally we have worked with a simple index of the data that allowed us to query the data with simple requests. These requests retrieved data back to us based on the query. However, today, the paradigm has changed. New computing capabilities and natural language processing allow computers to grasp and contextualise data - as well as put it to new uses. When in the past we searched for data, now we look for meaning and context. You, as a bank customer, have to overcome several hurdles when in need to engage with your bank. Firstly, you do not want to go to the branch. Your nearest branch was probably made redundant already as a part of banks cost savings, still reeling from overexposure to mortgages. If it is not the case, the opening hours have been shortened and therefore you will face the queue during the peak hours which are coincidentally the most convenient time for you to visit. Secondly, you do not wish to talk to a call centre agent as you correctly expect rather long waiting time on the line, awkward authentication questions, and then difficulty to explain the issue on the phone. Requiring client to download the app Getting client used to interface and the way how to use the app Client forgetting about the app on her smartphone Despite adoption hurdles and lack of functionality, you don't want to fall back for the physical solution where online ones are present and self-evident. If you can chat with your friends, search for information and have it found, your problems, be that a recipe, a food order or other menial task resolved online, why should you seek another cumbersome way of performing the task? It is becoming obvious that although built-in messengers with live agents are the way in the right direction, they face fundamental obstacles given the current set-up of the app economy. A solution for the post-app and, potentially, a post-smartphone world is needed. Interacting with a 24/7 availability intelligent robot (chatbot) on a commonly used messaging platform overcomes all these hurdles. There are no conversion hurdles in downloading a specialised app or log-ins at the bank's website as client already has her favourite messaging app on the phone. The app is most likely located in a prominent place on client's smartphone being opened several times a day. More importantly, instead of navigating menus while searching for the transaction, the client just types or says what she wants to do. The chatbot on the other side will understand the command. Sometimes, it will offer a simple menu of options to ease the interaction with the client. A good example is a recently launched TransferWise bot at Facebook's messenger platform, who offers a list of currencies and previously saved payment recipients. Many others chatbots are already helping people to track prices for plane tickets, remittance services quotes, order food, order a manicure, etc. With chatbots in financial services space, security should be taken very seriously. At the moment, the client is asked to log-in with their internet banking credentials to authorise themselves. The communication itself is encrypted by default. A number of messaging platforms offer a type of encryption that makes impossible to Facebook or others to read the conversation between the bank and the client. Chatbots in numerous visible and invisible forms will take over many tasks which are today performed in apps or at websites. They are the very foundation of the coming new era of post app store / post-app economy. Their initial success is based on their ample advantages in removing usage hurdles, speed, availability, and simplicity. Their success in the future will be driven by tighter integration with existing authentication mechanisms and further improvements in NLP (Natural Language Processing). There are vast opportunities for banks in the chatbots space ranging from obvious ones like customer service and initiating payments to more sophisticated uses like personal finance management or collecting late payments. Should banks transform themselves into digital ecosystems? Retail banks find themselves in double fire from regulation and consumer protection on the one hand and competitive pressures on the other hand. Banks should consider focusing on their strengths and speed-up the innovation process by letting FinTech players to build apps for their clients leveraging the Open API. Despite the considerable effort of sales and product departments within large banks to find new sources of revenue, it still seems that most of the financial innovation is happening elsewhere and outside the financial industry. The innovative potential of banks is hampered by a back-log of regulation and legacy information systems that have been designed in the “old economy”. It was estimated that new capital and liquidity requirements under Basel III accord will lead to a decrease of banking industry profitability from approx. 15% to 8-10% of ROE. At the same time, consumer protection watchdogs will prevent banks to make up the difference by charging various fees and commissions. If the conditions stay unchanged, these factors can only leave banks with cost reduction as the primary driver of profit. When the factors above couple with an increasing pressure of unbundling retail banks services by other industry players, it results in a perfect storm for banks. Although, the situation seem pessimistic, banks still have a handful of strengths. Firstly, banks still have and will continue to have a large client base. Also, they have unique expertise in credit risk that has been toppled by neither “social scoring” nor behavioural analysis of client shopping habits at the on-line supermarket. Banks possess rich data sets about their clients despite not utilising it as they could. Most importantly, only banks are part of an intra-country and cross-border payments infrastructure that is yet to be replaced by Bitcoin payments. A digital ecosystem is a complex value chain consisted of participants providing either content or a platform to distribute the content. Open banking API regulation could be an opportunity for banks, eventually, to leverage their strengths at the marketplace and become a provider of a financial platform. Banks can transform themselves into leading participants of digital ecosystems of third-party services that would be built upon existing client base and infrastructure. In practice, the financial digital platform would resemble an “App store” of verified apps like smart budgeting, micro-payments, retailer specific payment apps, loyalty schemes, bitcoin exchanges, etc. These apps would be installed on the platform by the client, and only she would have given consent for the app to access her data via a secure API. In such a platform, the client would be in the driver’s seat in choosing which user interface and functionality she prefers. Healthy competition among app developers to come up with the best and therefore “most installed” app in their category, would lead to innovation fed by an immediate feedback loop. Banks core competencies in risk management, and smooth operations of the payments infrastructure would be combined with latest data insight techniques, machine learning, and best in the class user interface. Taking the traditional path of competing alone against other banks and disrupters might not pay off because banks are not the only digital ecosystems out there. Nowadays, there are seven major global digital ecosystems competing against each other. Among them are Apple, Google, Amazon, Facebook, Tencent, Alibaba, and eBay. Each of them has aspirations to enter the financial industry. Most of them, with various success, have already taken the first steps (Apple Pay, Google Wallet, Amazon Payments/Amazon Coin, Facebook Payments, Tenpay/WeBank, Alipay, PayPal). These digital ecosystems will pose a far greater danger to retail banks than their traditional competitors or individual FinTech companies. I assume that the largest banks will attempt to create their digital ecosystems. Smaller or more specialised banks can join the ecosystem of their larger siblings or become the missing banking link in the seven non-banking digital ecosystems. Whatever the result will be, thinking about competition in the lines of ecosystems brings cooperation of the banks and FinTech companies into a new dimension. Britain’s next generation challenger bank has just received a banking license. Atom aims to take 8 million of the 64 million accounts in the UK, for which purpose it has secured £25 million of investments with an additional £75 million in line to be raised later this year*. More interestingly, Atom will start with mobile banking only, adding on-line capabilities (internet banking) later. This is similar to the customer acquisition and servicing strategy already used by existing players like Moven and Simple. However, these are not banks as such as they use a third-party bank as their back-office and for the regulatory cover. Unlike Atom, Moven is already fully operational, with $12.4 million (£7.9 million) of investments so far and the ambition to reach a client base of 25 million customers globally. By comparing Atom and Moven, we can clearly see that opening even a “mobile only” bank is at least 10x more expensive than a non-bank player. The key question is whether a digital bank can offer their clients more than Moven-like companies? Will the bank of the future be a bank at all? Banks need a banking licence to operate in a given territory. Only a handful of banks operate truly globally, due to licensing, different legislation and banking supervision rules. Even in the case of global banks, you cannot just walk into a branch in a foreign country and top-up your balance. On the other hand, payment card schemes, digital wallet services and blockchain are truly global financial instruments. For instance, sending money overseas with your digital wallet is instant and often free. It is so simple because, unlike in the banking world, there are no geographical boundaries for the digital services. Years ago, banks were the obvious place to go when you wanted to perform a non-cash transaction. With the development of the infrastructure we are surrounded by today, non-banking financial services providers do not have to rely on banks for providing transactional capabilities any more. Firstly, the technology to set up digital wallets with zero marginal cost transactions inside their ecosystem is widely available even to less tech-savvy organisations. Secondly, client on-boarding including KYC (Know Your Customer) can be solved by calling the API of a service that provide real-time client ID verification. Lastly, but most importantly, clients have the right devices in their hands that allow the delivery of relevant services given the context of the transaction. All this leads to the emergence of a “super wallet”, a smartphone application that fulfils a broad range of transaction services previously conducted by banks and single purpose financial services e.g. remittance payments providers. What’s left for banks? Yes, of course, lending is missing from the list above. 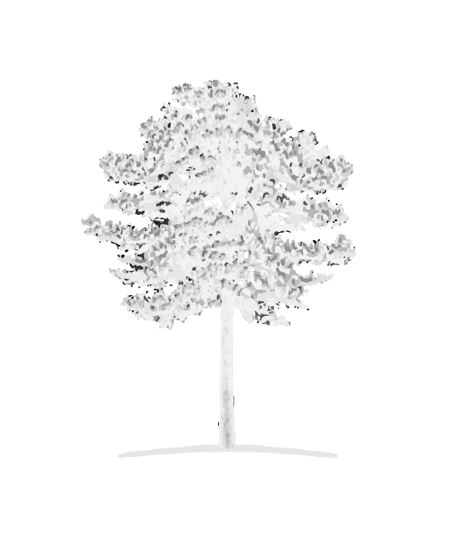 However, lending can be provided as a white-label product from a bank with a local license. Banks will perform their underwriting process based on demographic information, credit history and most importantly, rich transactional information from the “super wallet”. Although the non-banking services described above will still have to comply with AML / KYC rules, they will not require regulatory capital and complex regulatory reporting and compliance. The resulting savings will be passed to their clients, which will be warmly welcomed in the developed markets. At the same time, lower costs will decrease accessibility criteria for the unbanked population of third-world countries. Therefore, it seems likely that the bank of the future will not be a bank at all. The blog post reflects an opinion of the author and it is not an official point of view of PwC. * Atom’s goal is to achieve 5% market share in 4-5 years with the cost to income ratio below 30% opposed to 50%+ for incumbent lenders. Will banks merge with the FinTech sector? In previous posts, I introduced the concept of retail banks’ unbundling to particular services. Also, I outlined reasons why are FinTech companies successful. I stressed that banks could defend themselves by increasing their focus while simplifying the product range, looking at products from customer use case perspective, and ultimately driving down operating costs. In this post, I would like to elaborate on what is currently happening in the market and what are likely outcomes. Firstly, despite all the media attention, the FinTech sector is still comparatively small in comparison to the overall financial sector. In 2014, all FinTech companies in the UK generated £20 billion in revenue, which is still nimble in comparison to £8 trillion of UK banks assets in 2013. Despite FinTech start-ups willingness to provide complex financial offering, they do not possess payments and account insurance infrastructure that incumbent banks have. Although, Fintech companies can unbundle bits and pieces from banks offering, they still play an only marginal role in the financial services value chain. On the other hand, FinTech companies are often better in that particular service they provide than incumbent banks. Customers are increasingly switching to various FinTech user-friendly solutions that replace their bank’s products limiting their banks to regulated activities e.g. insured deposits. FinTech companies do not have access to the infrastructure associations of financial institutions built over the years. However, not having to maintain the banking infrastructure, they gained a significant operating cost advantage that they pass to their customers. A glaring example is Lending Club, whose costs over loan portfolio represent 2% vs. 5-7% of incumbent banks. I see two likely scenarios of future developments that are not necessary excluding each other. Scenario number one, FinTech sector will build parallel payments and trust infrastructure. For instance, bitcoin could become a new transaction currency (think USD role in international payments) and Blockchain payment infrastructure (think SWIFT, SEPA, etc.). It is already happening, as 70 million bitcoin transactions were carried out until now and their volume is exponentially growing. Only in the last 12 months, about 30 million bitcoin transactions were performed across the world with $19 trillion of value exchanged. Although, the numbers seem impressive they are still negligible when compared to 18 billion transactions carried out in the UK in 2012. Scenario number two, consists of banks undergoing digital transformation either on their own or by swallowing some of FinTech start-ups while embedding their technology into their operating models creating synergy with assets unique to banks (e.g. insured deposits). 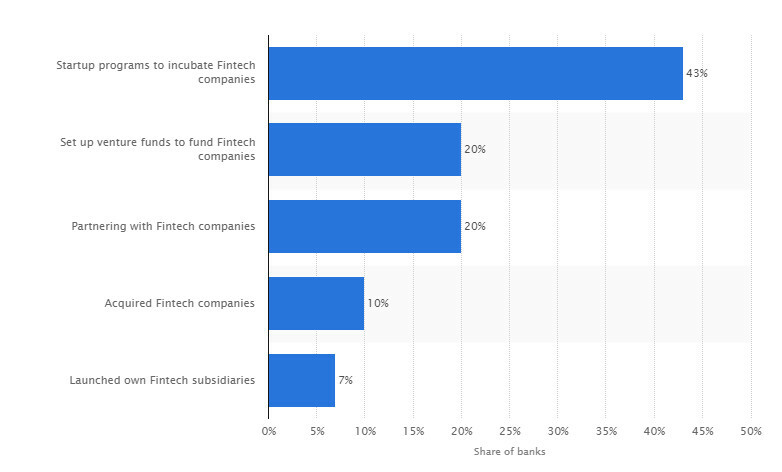 From recent data, it seems that banks are already frequently courting FinTech sector as a chart below demonstrates. I think that, to a certain extent, both scenarios will materialise. An alternative payment and trust infrastructure with an ecosystem of service providers and users will be built around Blockchain. The underbanked population in emerging economies will be early majority adopters of Blockchain based financial solutions. At the same time, banks will be exploiting new technologies to serve their customers better and drive down cost base. Over time, bank’s digital transformation will gradually move upstream the value chain from front office solutions to back office where the bulk of cost savings opportunities are. Therefore, we will witness and participate in interesting developments on both sides of the barricades. Can banks be more like FinTech companies? In the previous post, I have made a statement that people not only dislike their retail banks, but they even distrust them. Despite that customers tend to stick around with their banks instead of switching to another bank, which I diagnosed as fear that a new relationship might strongly resemble the current one. At the competitive landscape, we witness ‘great unbundling’ of a retail bank when banking business is being sliced into individual services that are then provided by FinTech companies, the disruptors. What people dislike about their banks? Research The Times did in 2013, add to the list a complaint that “ the bank does not understand her day-to-day financial needs”, a statement shared by 22% of respondents, is the most painful one. Banks have all the information and hence an ability to understand and develop their customers’ financial needs. However, banks mostly do not leverage it while financial services disruptors do. So what disruptors do differently than banks? Firstly, FinTech disruptors practice a Silicon Valley mantra to focus on one thing and do it well. For example, Transferwise does exclusively on-line international money transfers with a relentless emphasis on customer experience on every click she does. SpotCap does only MSE lending, Lending Club only peer-to-peer lending, etc. However, this sounds counterintuitive to bankers that are told to provide broad range of services and to focus on cross-selling on every interaction with the customer. The number of products per customer is one of the main strategic KPIs that banks regularly monitor. Instead of trying to cross-sell, FinTech companies stimulate desired behaviour of their existing customers. Continuously, they run improvement experiments on different customer journeys through their on-line platforms. Last but not least, they ruthlessly acquire new customers through ads, referral programs, and viral campaigns. You might have noticed that FinTech companies rarely challenge banks head-to-head with the same product. Rather than doing that they create their offering around customer needs in a given context or situation that is currently underserved. For example, Square and its clones did not try to compete with large POS acquirers (at least at the very beginning). Instead, Square defined new context to use payment card in situations that were for a reason overlooked by acquirers. Before Square, payment card holders would expect to use cards in retail stores, cafes, and restaurants. Shortly, with merchants whose turnovers justified buying expensive POS terminals and paying a monthly fee. However, a customer need to pay with the card in context of small transaction amount and in places like outdoor markets, cabs, or to self-employed craftsmen existed irrespectively of the prohibitive cost to serve this segment with traditional POS terminals. Therefore, Square created a solution for particular context that did not directly compete with the acquirers. Creating a product category on its own, generated a pleasant side effect as it allowed Visa to step in as an investor. Despite low-interest rate environment we experience today, banks need to receive a certain level of revenue to redeem significant fixed costs and satisfy their shareholders with adequate income per share. Should interest income fall as it does now, banks need to compensate for it by increasing commission income. Unfortunately, this is the root-cause of customers’ complaints about low income from saving coupled with high fees. FinTech companies do not have this kind of problem as they are usually lean on staff, and technology platform represents their primary fixed cost. Therefore, their two main business model parameters are to maximise active customer base growth to pay off the technology platform and to make sure that customer acquisition costs exceed customer lifetime value. Given the on-line service platforms, the cost to serve customers decreases marginally as the customer base grows. Hence, it is a less acute problem to worry about once the base is growing. Can retail banks imitate the success of FinTech companies? How can banks be more similar to the internet services we use and love? I believe that to a certain extent they can, and they definitely should try. Let's revisit the three FinTech companies’ characteristics and hint what banks could do. There is a lot to be done in the financial industry. There are people like Brett King, who think that banks are already doomed, and there are examples of successful bank transformation like Michal Panowicz’s turnaround of the Polish mBank. I clearly see the danger for banks, but even more I believe in banks’ innovative potential. Do we need retail banks for banking? With this post, I start a series of short posts of reflections on retail banking industry in the UK. However, I think that these challenges described here are applicable to the worldwide Retail Banking industry. What do customers think about their banks? If you are following the news about the retail banks in the UK recently, you might come to an impression that there is something inherently wrong with the whole industry. For example, in recent PwC research, just 32% of the respondents answered that they trust their retail bank. Although, it’s twice as many people than those who trust investment banks, still it is less than the proportion of people that have confidence in the police (52%) or the NHS Nurse (79%). Unfortunately, there is a good reason for the mistrust. Just in the years 2000-14, retail banks in the UK paid £38.5 billion in fines for misconduct on various issues ranging from unfair overdraft charges to Personal Payment Insurance mis-selling. What are customers doing with that? In contrast to what I said above, what is striking that the average relationship with the bank lasts for 26 years in comparison to 11 years of the average marriage. Despite the recent easier switching account procedure, 64% of customers decided to stay with their current bank apparently in fear that the new relationship will resemble the old one. It further strengthens the conclusion that the whole industry is being challenged rather than individual banks. Moreover, clients experience great customer services with other service providers like these from e-commerce and transfer these expectations to their banks. Although, customers might not be switching banks, they are taking whole categories of transactions away from the banking sector to the financial technology disruptors. Nowadays, there is a disruptor almost at every product category offered by a typical retail bank (see the image below). Disruptors usually focus just on one product category, in which they serve their customers faster, deliver a better experience, and charge less for their service. Banks choose various strategies to cope with the situation like setting-up own low-frill digital-only banks, developing counter-propositions to the disruptor’s products, building alliances with disruptors or even purchasing them before they become too expensive to acquire. Despite all the right effort, it seems that banks are just trying to catch up a train that is getting on speed. However, why they are just catching breath instead of sitting in the conductor’s seat? I believe there are three major factors that are hindering banks from becoming innovative, customer focused, and agile. Firstly, banks today are still organised around what we call “product silos”. In practice, it means that the manager responsible for credit cards develops and promotes her product in isolation from the manager that curates consumer loans. It happens despite the fact that the credit card and consumer loan are just different forms of satisfying the same customer’s need for cash. Secondly, regulation like “Know Your Customer” and limitation on promotion of certain complex products make banks seem cumbersome in client acquisition, and value added sales. Lastly, the array of complex organisation structures and legacy information systems prevent banks from moving fast enough in order to respond to the industry challenges. In the next posts, we will look at some solutions for the retail banks to this situation.